Miranda and I went to Brenu Beach today after both reading about it (as Ghana’s prettiest/best beach) and being told by a local ex-pat that it truly lives up to what we’d heard. According to the site I’d found it was just 30 mins outside of Cape, via trotro, with a shared taxi to the beach. We walked to the trotro station, paid $1CEDI, waited about 10 minutes for the trotro to fill (so far we have waited far, far less at these sort of junctures than I have read about, so I am dreading when we land on the other side of the bell curve, haha), and then were off. Sure enough, about 30-35 minutes later we found our junction and got off. We learned another good lesson here too, having read that a share taxi is 70 peshawas (about $.50). When we got out immediately we had cries of “where are you going! I take you!” and we said “shared taxi, Brenu,” to the first cabbie who walked up to us. He said “ok, 40 peshawas.” That was my first clue — a rate that was lower than the standard rates. Shared taxi or trotro fares are pretty standard(event though it’s an informal system), and will be standardized for us, or slightly inflated (since we are white). We got in. Taxi was empty but us, and the driver then said “I take you now, 3 Cedi.” Hah, clever. Miranda insisted we wanted a shared taxi and he seemed to acquiesce. So we sat. Waiting for it to fill. Normally we have always grabbed share taxis when they are already moving and have people in them. Today I learned a lesson — never be the first guy in a share taxi. If you are African it may work out, but if you are white you are asking to be taken advantage of. We sat for a while, debated how many other random people would wander along to come to Brenu from this particular rural junction, and then decided to aim for a $2CEDI ride minus the “share” part (so we could just leave now). After all it was supposed to be $1.40CEDI for share (me + miranda). Anyway, we got him to $2.50CEDI and I was fine with that. We agree, he says okay, and all of the sudden the taxi fills with people. Basically he already had all the fares he needed to go to Brenu, but why take us all in a share taxi when he can hold out for a bit to see if we break and then charge us charter-taxi rate (and then stuff a bunch of other people inside anyway). I was more amused by this than offended and just went with it, since I don’t care if there are other people in a car with me. But it was a pretty clever scam. I was truly amazed at the speed with which the car filled. Lesson learned. We later caught a taxi back from Brenu (which is truly the middle of nowhere) for $2CEDI (that was his asking price), further enforcing that we got ripped off by our first ride. I should also point out that these things are only interesting to me as cultural insights, I don’t really care about the money. $2.50CEDI versus $1.40CEDI is a difference of maybe eighty cents. When I get ripped off for $.80 I am usually pretty fine with it. $8, or $80, is another story! Brenu has a “resort” there and charges $1CEDI admission for access to the beach and facilities. This is trivial and well worth it for the showers and restroom. They have a kitchen and the food at Brenu was okay, but it was immediately swarmed with flies when we were served, so I think I wouldn’t eat there again if given a choice. Since Miranda got typhoid (and is now A-ok!) I am a little more paranoid about flies (one way it is spread) landing on my food. Also, we assumed it would be about the same as Oasis (the Obruni restaurant here we eat at about once daily) as far as price, and it was closer to double for many dishes. So if you go to brenu, be prepared for $5-15CEDI/plate (I usually eat at Oasis for $3-4CEDI, which is $2-2.50USD). Our total meal was $20CEDI including Miranda’s Juice and VAT (for a total of $14USD … a hefty sum over here). I setup a slackline on the beach and it was almost instantly mobbed. Wholeheartedly mobbed. My line is dirtier than it has ever been (from wet and sandy feet). But all of the Ghanaians on holiday there had a great time on the line and showed a lot more bravery than Americans typically do (I had the line set about 5 feet up, way too high for most Americans to give it a try, and Ghanaians are an average of only about 5.5′!). We met a girl named Sara from Kumasi who came up to us and introduced herself and got several pictures with me, hah … I can only imagine the facebook captions. I wanted to write a little bit about the food here. I have a unique, or perhaps biased — depending on your own outlook — perspective because I am a strict vegetarian, but I’ve noticed some things about the food here. Again, because of what I have been able to eat (which is not much), I have only partial personal experience with Ghanaian cuisine (although redred, their beans-and-plantaine dish, is mighty tasty once you get past the grease). Everything here is unhealthy. Period. Hah, I feel bad writing that, but it’s true. Palm oil is some nasty looking stuff (and conversely it makes things pretty tasty, which is a good rule-of-thumb, I think, for establishing its deleterious effects!) … it’s bright orange, and seemingly everything is fried in it, and then maybe has a little extra poured on top for good measure. To compliment the palm oil it’s the bleached flour nature of everything here that really, for me, cements the unhealthfulness of the cuisine. All of the bread, absolutely all of it, is bright white. Girls wander around selling plantain chips (sliced plantains fried in oil, like potato chips). Other girls wander selling fried dough balls. Every third stand on the street is selling wonder-bread-looking loaves. I wanted to talk a bit about diet though, because at some point diet becomes a problem for a developing society. To start you have sub-subsistence, which is definitely a problem as far as food is concerned. But once you are subsisting, at some level the diet tends to peak in healthfulness, where you’re eating a lot of fresh vegetables, everything is fresh cooked, no preservatives, etc. To that end, Ghana does well to a degree — the meat here is free-range, antibiotic free (that I know of), and so forth. People cook fresh meals, and there are vegetables used in the dishes (although many of the dishes use things like Gari, which is made from Cassava and is basically starchy filler). Mexico has a GNI of around 10x as much per capita as Ghana. In the last five years Mexico has experienced a 37% increase in soda consumption, a 6% increase in refined carbs, and a 30% decrease in vegetable and fruit consumption. That is scary stuff! So can look to Mexico to see the Westernization of diet, and it’s intense to see how Westernization is making its way down the scale of income. So Ghana, which is still well below apexing on the bell curve, gives me both pause and hope. Hope because I don’t see McDonalds or other negative Western fast food influences setting up shop here [yet]. But pause because CocaCola is everywhere, the bread is all white, the vegetables are inert or battered and fried in palm oil, and by 2030 ischaemic heart disease will be the #1 killer in poor countries (it already is in rich countries, killing around 600,000 Americans per year). This entry was posted on Saturday, October 2nd, 2010 at 9:19 am. 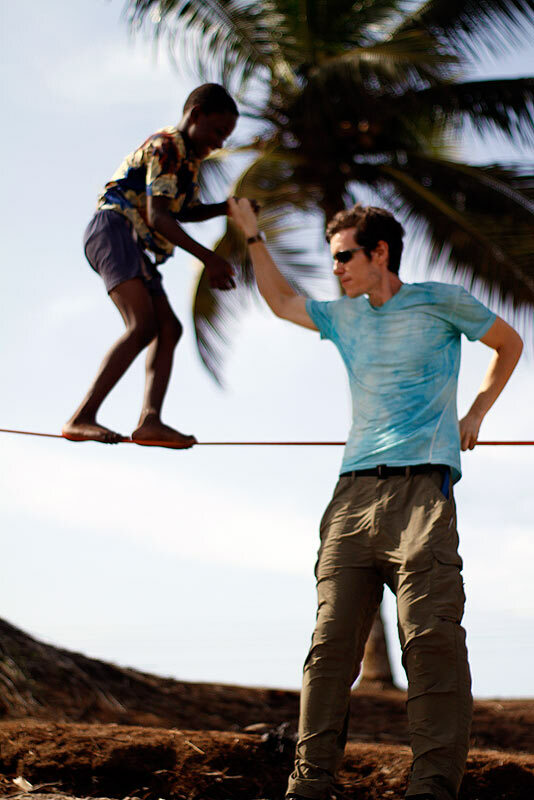 It is filed under Blog - Adam and tagged with Brenu, Cape Coast, Food, Ghana, Slackline, Taxi. You can follow any responses to this entry through the RSS 2.0 feed.